From Marcus Stern and Sebastian Jones, the story of tankers filled with volatile crude oil extracted through fracking operations in North Dakota, traveling by rail through Canada and the U. S. Five shipments of crude have exploded during the past two years. 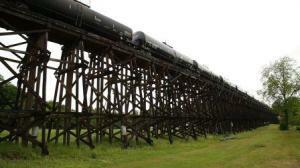 The railroad cars are old and defective, wooden rail structures are crumbling, and 47 residents of a Canadian town are dead. Stern and Jones report that U. S. regulators are working on the problem, but without a deadline or sense of urgency. The investigation was conducted in collaboration with InsideClimate News, The Weather Channel, and the Nation Institute’s Investigative Fund. View the Weather Channel video. Read more. 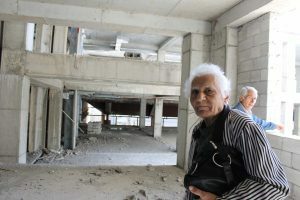 Roza Hovhannisyan reports from Armenia for Iragir.am on the frustrations of people evicted from the old town center of Yerevan, waiting more than ten years for decent housing. The European Court of Human Rights will resume the examination of applications of three families evicted from 25 Buzand Street at the center of Yerevan. These families were deprived of their property in the result of demolition of old center of Yerevan. The houses of this territory were demolished in 2004, and most affected families are still homeless. In 2011 the ECtHR passed a decision on the cases Baghdasaryan-Zarikyantses v Armenia, Gharibyan v Armenia and the Ghasabyans v Armenia but the government of Armenia has not implemented the decision yet. (Washington) The Fund for Investigative Journalism has extended its grant proposal deadline to Monday, February 2, 2015 – 5pm Washington DC time (EST). The typical grant is $5,000. Qualified grant expenses include out-of-pocket costs such as travel, document production and equipment rental. Small stipends may be considered as a part of the grant. FIJ is currently accepting proposals for domestic and overseas investigations. Visit the FIJ website for detailed instructions and on-line application form: http://fij.org/grant-application/. FIJ welcomes calls and emails with questions about the application process. Email fundfij@gmail.com or call 202-662-7564. Greetings from the Fund for Investigative Journalism. We sincerely hope you find yourself surrounded by family and good friends during this holiday season – and that you have the time to enjoy it all. Amid the hustle and bustle this time of year, we hope our friends in and outside the world of journalism can take a few seconds to reflect on how dedicated reporters were able to overcome our industry’s growing challenges and delivered stellar investigative work in 2014. It is indeed tougher these days to dedicate sufficient time and resource to investigative journalism. Readers say they want it; publishers say they’re committed to it. Yet the amount of money earmarked by the commercial news trade for investigative reporting continues to shrink. 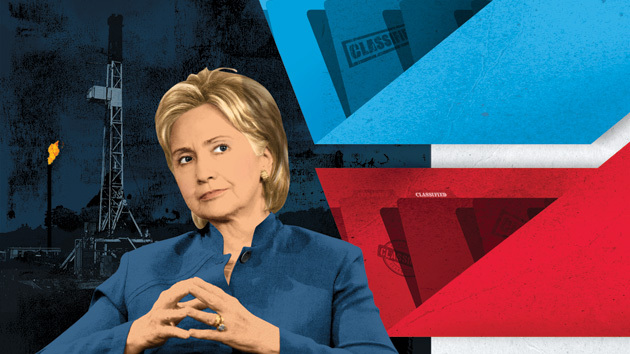 More investigative journalists face the prospect of letting stories go for a lack of resources. More journalists are digging into their own shallow pockets – even borrowing money – to bring projects to print or air. The refreshing news is that 2014 was a very good year for investigative journalism – deep, aggressively researched stories yielded change around the world. At the end of my first year as president of the Fund for Investigative Journalism, I can say with pride that 12 of the best minds in the business came together in 2014 and distributed $216,000 to 49 journalists around the globe. Thompson parlayed a $4,000 grant from FIJ into a project that exposed a major wrong. A lawsuit has been filed against the practice in Philadelphia. It’s a challenge I am sure law enforcement and prosecutors around the country will follow closely. This is what FIJ does: Our grants, which in 2014 averaged around $4,400, are designed to help independent investigative journalists cover expenses and take the extra steps necessary to complete a project. FIJ continues to grow, and with careful planning and new outreach programs, we expect 2015 to be our biggest, busiest year. We have gotten to this level with tremendous support of foundations and families who share our goal of sustaining independent journalists who hold truth to power. But our real strength is the mutual support of like-minded journalists. Take our board, for example. Not only did these outstanding journalists volunteer time and intellect, they all contributed their own, individual donations to FIJ in 2014. A check, or an online contribution of just a few dollars, makes all the difference. Look at what we did in 2014. Imagine what we will do in 2015 with your valuable support. (Washington) – The Fund for Investigative Journalism is pleased to announce The Morton K. and Jane Blaustein Foundation has awarded a two-year $60,000 grant to support the Fund’s grant-making program. The general operating grant underwrites the Fund’s program for independent reporters who have the ideas, sources, and know-how to produce groundbreaking investigative journalism, but need help paying the expenses of reporting. The support will also help the Fund conduct a mentoring program in partnership with Investigative Reporters and Editors (IRE) and the Society of Environmental Journalists (SEJ), which recruit veteran journalists to mentor grantees over the duration of their projects. The Fund for Investigative Journalism has supported hundreds of investigative reporting projects since 1969, when it paid Seymour Hersh’s travel expenses to help him check out a tip that civilians had been massacred by American soldiers in My Lai, Vietnam. The Morton K. and Jane Blaustein Foundation, based in Baltimore, supports nonprofits active in the fields of education, health care, human rights, and social justice. In addition to support from The Morton K. and Jane Blaustein Foundation, the Fund for Investigative Journalism receives foundation support from The Ethics and Excellence in Journalism Foundation, The Reva and David Logan Foundation, The Park Foundation, The Nicholas B. Ottaway Foundation, The Gannett Foundation, The Green Park Foundation, The Nara Fund, and from individual donors, many of them referred by the Catalogue for Philanthropy: Greater Washington. Pro bono legal services are provided by Dykema Gossett PLLC, a national commercial law firm with a broad portfolio of community service and pro bono clients. Pro bono business advisory services are provided by Leigh Riddick, Associate Professor of Finance at The American University’s Kogod School of Business. Donations for the Fund’s grant-making program can be made online, www.fij.org, or by mail to the Fund for Investigative Journalism, 529 14th Street NW – 13th floor, Washington DC 20045. The Fund is currently accepting grant applications for foreign and domestic investigations. The next deadline is January 15, 2015 – 5pm EST. 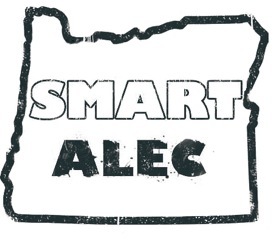 From the investigative team at KBOO Community Radio, Portland, an investigation of the influence that the American Legislative Exchange Council [ALEC] has on laws passed in the state of Oregon. KBOO reporters found that ALEC model bills are introduced, virtually word-for-word, to benefit the corporate-profit mission of ALEC, at the expense of consumer and environmental protection. The reporting team cited many examples, and highlighted two bills: one that requires homeowners who install solar panels to in effect subsidize electric utilities, and another that protects the Monsanto seed company from competition. The reporters also uncovered one legislator who was using ALEC lobbyists as his research team. In addition to a series of radio reports, KBOO developed a website that displays the results of its investigation. From Mariah Blake, for Mother Jones, the story of “energy diplomacy” that promotes drilling in foreign countries. From Joseph Sorrentino, for In These Times and The Santa Fe Reporter, an investigation of working conditions at diaries in New Mexico. Workers routinely work overtime without extra pay, and are subjected to dirty, dangerous conditions. But since most New Mexico dairy workers are undocumented immigrants, they are afraid to complain. Sorrentino tells the story of a worker who, despite suffering a fractured bone after a cow stepped on his foot, was unable to take sick leave, and another worker who was kicked by a cow, which broke his leg, then fired after he took three months to recover. Dairy farms in New Mexico are “strongly encouraged” but not required to get workers’ compensation insurance. 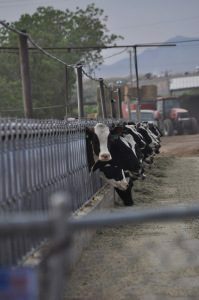 Dairy workers tell Sorrentino that the owners treat the cows better than they treat their employees. From Wallace Roberts, for The Crisis Magazine, an investigation of the demise of nursing homes serving poor and minority neighborhoods, due to historic underfunding rooted in Jim Crow decision-making. Roberts probes the case of the Lemington Home for the Aged, a microcosm for a national problem. 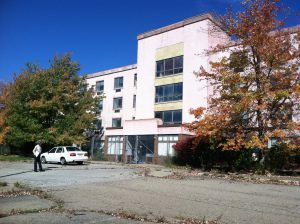 The Pittsburgh home, a long-standing community-based institution, closed after a death investigation found chronic understaffing and a high rate of health related violations. The home’s finances were further impaired because it could not afford to hire a skilled accounting clerk to file complex federal reimbursement claims, which if paid, had the potential to keep the home on a healthier financial footing. 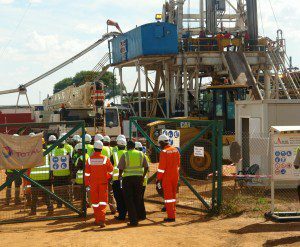 From Joseph Mazige, for Munno Voice of Uganda, an investigation of newly developed oil fields, which have failed to meet expectations for reducing joblessness and poverty. Instead, the oil companies provide good jobs for skilled foreign citizens but offer local residents positions as guards and laborers. Local business owners also complain they are denied service contracts; the foreign oil firms do not believe they meet their standards. A scholarship fund has been established by one firm to begin to address the skills gap. Local residents also report that violent evictions and land-grabs have cleared the way for the international oil companies.